People engaged in the simple act of riding their bicycle from point A to point B have been labeled by the city’s most ardent bike haters as zealots, fundamentalists and, in one famous case, terrorists. 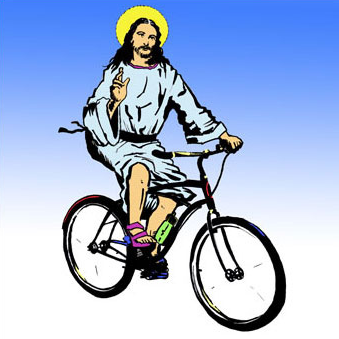 I prefer to think of myself as a peace-loving evangelical, happy to proselytize to anyone willing to convert to bike commuting, so this holiday season I’m asking my cycling brethren to do what all good evangelicals do: tithe. But fear not! I am not asking you to donate 10% of your annual salary to the Church of the Bike. What I am asking you to do is to consider how much safe cycling and the bike infrastructure is worth to you and to make a donation to the organization that makes it all possible, Transportation Alternatives. More on that later. So how do you decide how much safe cycling is worth to you? I found an easy way to make my calculation. As you can see, I kept two running totals, one showing how much a day’s trips would have cost me if I used a weekly MetroCard at $2.10 per ride, a figure that I based on approximately 14 rides per week. The other was a comparison to the cost of a subway or bus ride at the full fare of $2.25. I was really strict about tracking my progress through the year. One might even say I was religious. I only included trips, or legs, that would have otherwise been taken on a public transit had biking not been an option; trips to the grocery store didn’t count, even though I frequently shop by bike. I also didn’t include trips made possible because of biking, such as a visit with a friend in Greenpoint whom I never would have agreed to meet if it had involved a transfer to the L in Union Square. Five hundred dollars might not seem like a lot to people who get pro bono legal representation, but it’s a significant savings for us “real” New Yorkers, especially considering the looming threat of fare hikes. Basically, I saved enough money since April that even if I stopped riding for the season today I’d have enough money to pay for about five months worth of MetroCards, more than enough to get me through the winter doldrums. Yes, I had to get my bike tuned up a couple of times this year, which won’t be free until I become a better bike mechanic. I only had two flats this year and one emergency brake adjustment, which ate into my overall savings. I also probably eat a few more bananas than the average New Yorker. But since my commute became my exercise I cancelled my gym membership, resulting in $70 staying in my bank account each month. I don’t know if I can credit this to the riding, but I haven’t taken a sick day since last winter. As a freelancer who doesn’t get benefits through his job, that’s real money. So, considering where my money would go if I returned to public transportation, I thought that I owed at least some portion of it to the organization that has made 2011 my favorite year for cycling since I moved here in 1998. I thought of all the great work Transportation Alternatives has done to make each of my rides as safe as it can be and the way in which so many of the dedicated staffers there have become not only great supporters of this blog, but friends. Donating to TA was a no-brainer. My fellow evangelicals, fundamentalists, zealots, or simple bike riders, I encourage you to tithe to TA in the loosest sense of the word; donate ten percent, twenty-five percent, fifty percent, or even just five percent. Donate whatever you can afford. Maybe it’s in the subway rides not taken, the old clothes that now fit, or the gallons of gasoline not burned, but biking brings with it tremendous benefits. Those benefits are only bound to increase as TA continues its hard work and advocacy to build the city we know New York can become. Donate today. This is my last post of 2011. Many thanks to my readers, commenters, lurkers, and friends. I’m looking forward to a wonderful new year and can’t for 2012 — bikeshare! — to begin. well said my friend. well said indeed. Kudos on commuting by bicycle, I try to do the same whenever possible (unfortunately I have to drive and take the subway for work too, depending on where/when my work assignments take place) so I really commend you on that. On the other hand, I’m not sure I agree with your call to support the TA, financially or otherwise. I’m not sure the TA represents the interests of all NYers; they surely don’t seem to represent mine, an avid biker who also parks a car in the streets (and is forced to drive it once in a while). There are those who accuse the TA of having become a political trampoline for people with political ambitions. I’ll take a pass on financial contributions until I find an organization really committed to educating drivers that running over cyclists it’s really not such a nice thing. The rest, all those painted bike lanes, huge planters, cafe tables, mid-street parking, etc., may be actually doing more harm than good.